What a homecoming game it was for the Lightning. This was my first game this season I have attend in person and what I can tell you is that this team is impressive. I knew going into the game that the defense was good…but I did not realize how good they were until I watched them in person. Glenelg came into the game at 5-1 and the Lightning were 6-0. Glenelg got the ball first and marched right down the field handing off to their running back (#6) and scored a touchdown giving Glenelg the early lead. The Lightning defense then stepped up and shut down the Glenelg offense from scoring again the remainder of the game. The defense caused 4 turnovers and scored on two LONG fumble recoveries. Oh yeah, the offense added 21 points on the ground and through the air giving the Lightning an impressive 35 to 7 victory. As Jalen Hall walked onto the field before Long Reach’s game against Glenelg on Saturday, he peered into the spirited homecoming crowd and noticed some familiar faces. He could spot them anywhere. Those faces were on Hall’s mind hours later in the wake of the Lightning’s 35-7 rout of the Gladiators, which ensured Long Reach matched its best start through seven games in school history (2004) a season after finishing 2-8. The victory was an historic feat, but it also served as a statement for Long Reach. The Lightning saw the Howard players in the stands, and hope their dominant performance sent a message leading into next week’s showdown of unbeaten Howard County programs. The contest proved perhaps the biggest test for the Lightning this season. With shifty sophomore Wande Owens leading the way, Glenelg (5-2) brought a three-game winning streak into the contest. Owens lived up to his billing on the opening drive, taking seven carries for 61 yards, the last of which was an 11-yard touchdown run. Glenelg’s defense adjusted. Owens still finished with 132 yards, but the Lightning stifled his progress as Benton forced a pair of fumbles. The first strip came on Glenelg’s opening drive of the second half, and sophmore Luis Gooden Jr. recovered it for an 88-yard score to put Long Reach up, 21-7. Two possessions later, it was junior Dane Lynch Jr. that scooped up Benton’s handiwork. He scampered 75 yards down the left sideline for another touchdown. As he was getting mobbed by teammates on the sideline, Lynch turned toward the crowd and mimed the Superman celebration. Long Reach scored once more, when senior Tyler Raines found junior Derrick Noble for a 10-yard strike early in the fourth quarter. From there, Coach Jamie Willis inserted his subs on offense. After the final whistle had blown, Willis hunkered down and placed his hands on his knees. The coach usually chides his team for becoming too caught up in the moment, reminding them to focus on being 1-0 each week. But after the team prayed, Willis started jumping up and down and as the giddy Lightning players crowded around him and hollered. Even in the wake of the momentous win, though, Hall couldn’t stop thinking about the faces he saw in the crowd, and neither could his teammates. 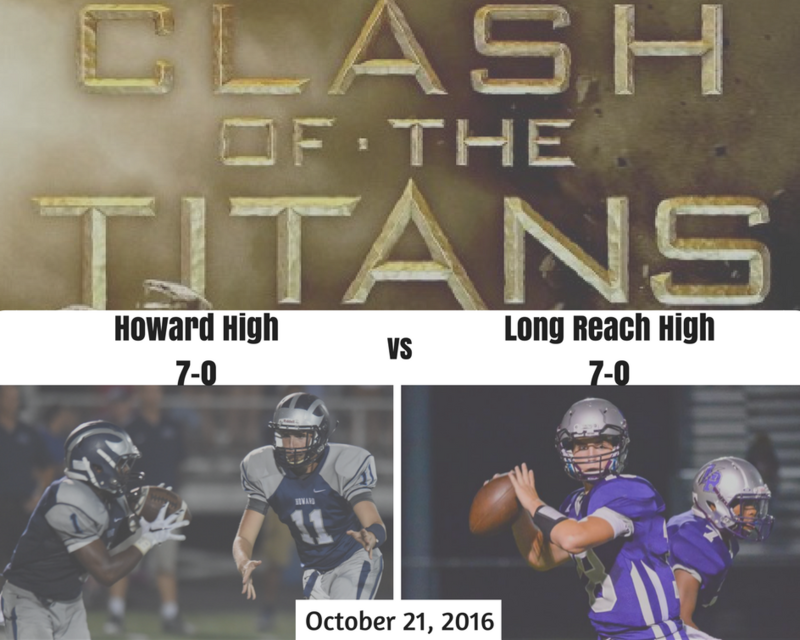 This now sets up a “Clash of the Titans” type match next week as 7-0 Long Reach High visits 7-0 Howard High. Howard has not lost a county game in a LONG time (31 straight county wins)…but they better not overlook the Lightning because this team came to play this season.